Five Rivers MetroParks sank more than 500 Christmas trees in Eastwood Lake in January. Don’t worry — people were done with them. Lakes need protected places for small fish to lay eggs, so that big fish will have more to eat and anglers will have more to fish for. 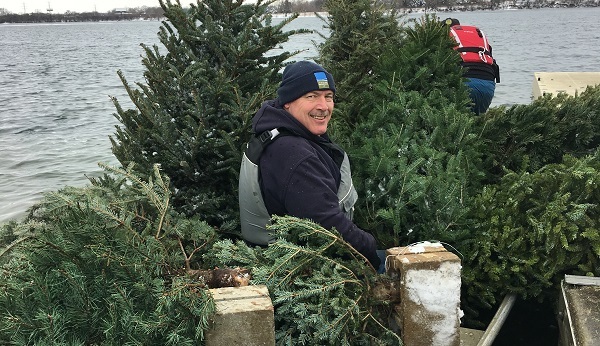 Eastwood’s shoreline doesn’t have enough trees and branches naturally falling into the water, so Fiver Rivers crews bundled the donated evergreens in twos and threes, tied them to cinder blocks donated by Snyder Concrete and plunged them to the bottom of the 185-acre lake. The project was prompted by a 2015 Ohio Department of Natural Resources study of the size and health of the fish population at Eastwood. MetroParks plans to assist Mother Nature like this until surveys show the population has improved. Want to see where the trees were dropped? View our map.